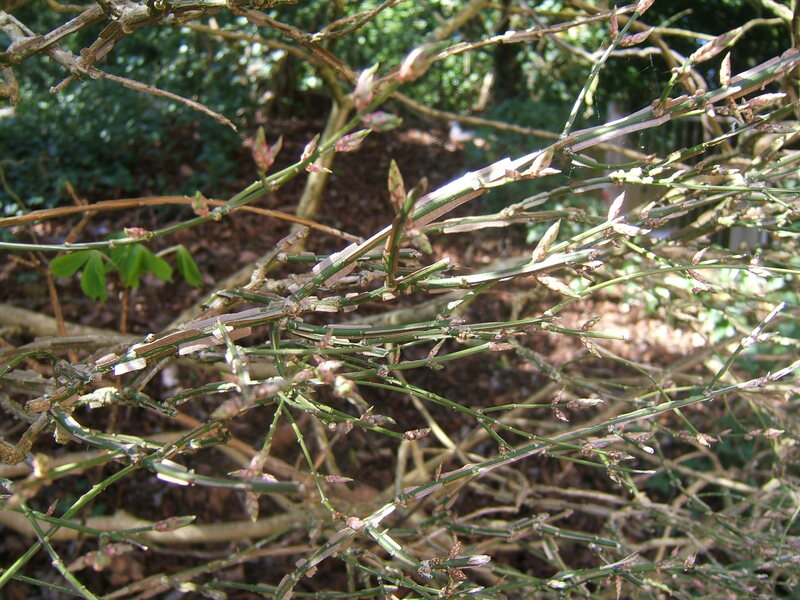 While I was looking at the planting at work, I suddenly recognised Euonymus europaeus (aka the Winged Spindle). I had this shrub in my garden, but hadn’t seen it for quite a while. Last weekend, I was pruning my shrubs and decided to clear the area between the shrubs and the fence of dead branches as I have a fence post that needs to be replaced. Suddenly, I found my Euonymus. It has been shaded out by the other, faster growing shrubs, but it was still alive! This is a very distinctive shrub as the stems have wings sticking out at right angles to them which are a real feature in the winter. It is supposed to have pink to red flowers in May, but I can’t ever recall seeing them, maybe because they are described as “inconspicuous”. As I read up on the shrub though, I realised that there are some down sides to it. It is much liked by aphids and more to the point poisonous – so not a good plants where there are dogs around, especially a young puppy. It is a good job therefore that I had the perfect position in mind to move it to. The Phormium in the front garden that only just made it through the winter before last has finally given up the ghost. It was planted beside a conifer and so the part of the conifer that was shaded by it is brown and will not recover. I therefore need a tallish plant to fill the whole – the perfect place for the Euonymus :). Despite the fact that much of the Phormium is rotten and so the leaf spikes just pull away from the plant, the roots are very firmly still hanging on to the soil. I will have to borrow a pick axe to get it out of the ground – good job I have a friend who owns one. It was so nice to not only find a “lost” plant, but also to have the perfect spot for it just waiting to be filled.